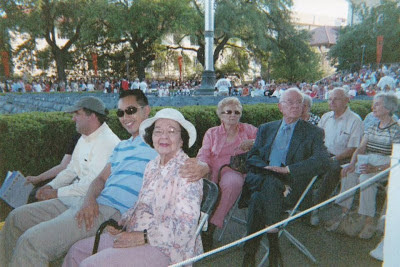 For those that do not already know, my grandmother passed away in her sleep about 5 weeks ago at the regal age of 104. In the days since, there have been plenty of tears, with little things from everyday life suddenly reminding me of her and reducing me to a blubbering mess. A rose in full bloom, a woman crossing the street with a walker, the pop of bubble wrap, an organ playing at Church. Even writing this now is extremely difficult without tears blurring my vision. But when someone has lived such a bountiful life, how can one truly be sad? When I think about all that she's seen, the ways in which the world has changed, the things she has risen above, and all the lives that she's touched, from friends, family, to her countless grandchildren and great-grandchildren, I see a life and a legacy to be celebrated. But regardless, the tears still come. 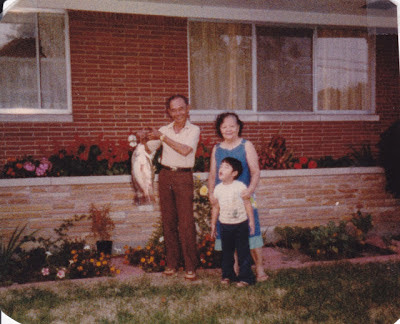 From infancy to my toddler years, she was my main caregiver while both my parents worked full-time. And if you think that I was an agreeable, easy-going child, you would be mistaken. A handful would be putting it mildly. I am actually the reason my grandmother had dentures, as a tantrum in my early years resulted in me knocking out my grandmother's teeth. [cringe] But despite all that, she remained patient with me, and she continued to believe in me and the potential she saw, knowing that a stormy youth could lead to a calm and centered adulthood. And through all of that (trust that there was plenty more), I somehow became her "favorite." I still have vivid memories of her holding my hand as we walked home from school, sitting in her room listening to Big Band, the strong afternoon sun washing through the white curtains as we dipped sponge cookies in drinking chocolate, watering plants in the same friendly way that she would greet everyone at church, and sitting at the kitchen table spending entire afternoons singing hymns while prepping vegetables for dinner. She raised me to be the man I am today, and not a moment will go by that I will not be able to see her and feel her in my actions, my words, my heart, and the pursuit of my dreams. My grandmother, her brother, and I, circa 1982. Visiting me in Austin in 2006. 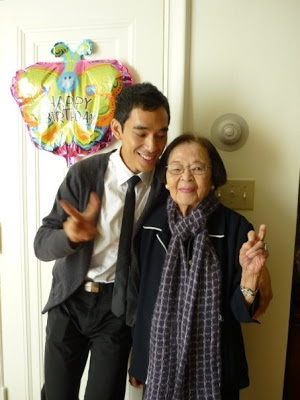 One of my favorite pictures with her at her 101st birthday. 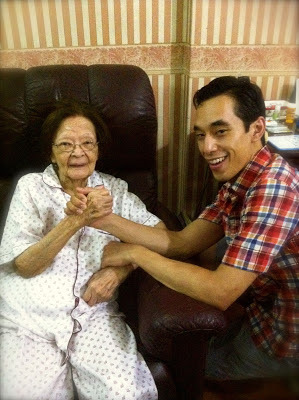 My grandmother and I "arm wrestling" this past Fall. 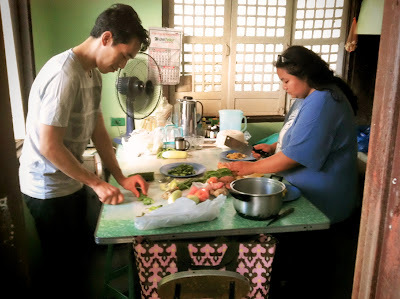 Today's main ingredient, bitter melon (aka ampalaya in the Philippines), was her favorite. And while many will call several things their "favorite," this was hers for real - #1 on her list. I remember the first times that I had it as a child, not quite being able to appreciate the bitterness and scooting it to the side of my plate with a wrinkled nose. She would laugh at that, and scoop it off my plate to eat it herself, which made me laugh as I pretended to protest. But as I grew older, the bitterness and the bite grew on me, and slowly and surely it became one of my favorites as well - a nostalgic flavor I now crave when temperatures climb and the days begin to stretch. When I was in the Philippines this past fall, I made sure to learn as much as I could about preparing bitter melon, and today's recipe was inspired by one of those afternoons spent in the "dirty kitchen" of a close family friend in Laoag. A bevy of beautiful vegetables fresh from the market in the Philippines. The "dirty kitchen": The one that's used as opposed to the one just for show. So today, on the 40th day after her "going home," I share this recipe for a simple bitter melon salad in a garlic and scallion vinaigrette. A recipe that I know she would absolutely love. 2. Rinse bitter melon well to remove the salt and pat dry. Combine with onion and tomato in the other medium bowl. 3. In a small bowl, combine all ingredients for vinaigrette except oil and whisk until loosely incorporated. Slowly drizzle oil into the mixture while whisking to bring the vinaigrette together. Canola, sunflower, or grapeseed would work nicely here. 4. Pour vinaigrette over salad and gently toss to coat. Can be served immediately, but I would recommend giving it an hour or so to allow the flavors to come together. Scoop out the pulp and seeds and then slice. I always save the seeds to plant. Dressed and ready to toss and chill. I have made a small altar to honor my grandmother. It is tradition to leave food and drink at the altar for the spirit of the departed, a food offering also known as atang in the Philippines, and I have been finding myself buying things I would never otherwise purchase, like dark chocolate, Coke, and sponge cake - things she loved. So after making this salad, I was particularly excited to leave a small dish of it for her - something we could enjoy together. The bitterness balanced with the sweetness of tomatoes and the pungency of onions and garlic is stimulating to the appetite and also quite refreshing, making this a wonderful appetizer to share during the long, hot days of Summer. The last time I saw my grandmother, I knew that it was possible that it would, in fact, be the last time. And even though she had a good appetite, was getting around with little help, and was impressively lucid, as I waved goodbye to her, tears streaming down my trembling face, watching her wave back, no longer able to hide the sadness filling her tiny body, I was suddenly very aware of my surroundings, as I wove a memory that I would always be able to return to. The moment of saying both 'Good Bye' and 'Thank You' to the woman who raised me. The moment of letting go. Bitter melon seed sprouting. I hope it will grow into a strong, bountiful vine. And while I mourn the physical loss, I know that she is still with me. I feel her here, no longer oceans apart. And in that way, I take comfort in knowing that she and I will never have to say Good Bye for good. She'll be there for all the milestones to come, seeing that all her hard work and sacrifices paid off. That a stormy, selfish youth has transformed into to a centered, compassionate young man ready to spread his wings and fly. That her legacy will continue on. 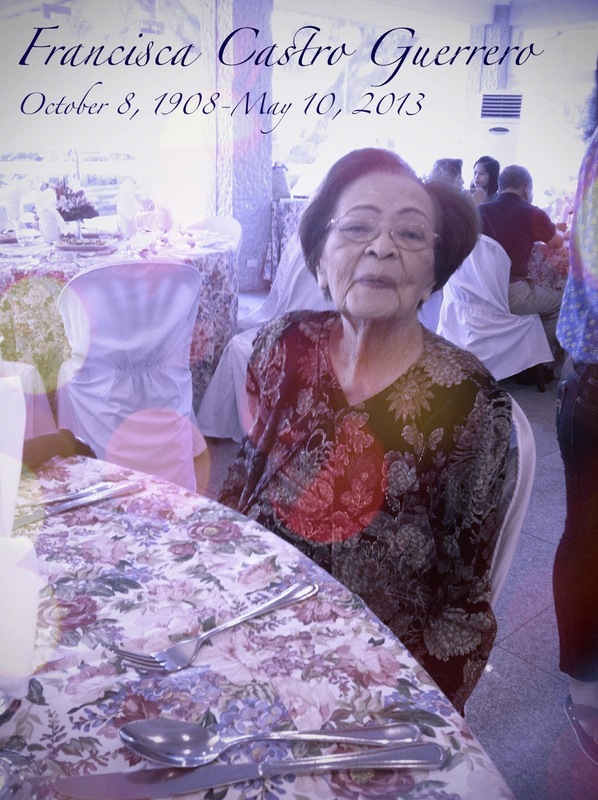 Rest in peace and happiness, Lola. You will always be remembered and loved. She was lovely, I can tell! Grannies make such an investment in their grands. She made an eternal investment in you. Kuya, Lola is always smiling with us. She would have loved this ampalaya salad. The indelible mark that Lola has left us will never be hidden in the shadows. There will never be a time where we have anything Ampalaya, that we won't think about Lola and toast to her. Mabuhay, Lola! We love you and miss you.